SME to large Retailers who sell on multiple channels including retail stores, pop-up stores, Amazon, eBay, Shopify, WooCommerce, and Magento. 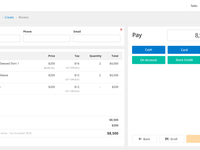 Primaseller POS includes features like inventory sync across multiple stores, multiple registers, a digital catalog of products, barcoding, invoicing, user permissions, split payments, taxation, purchase planning, and more. 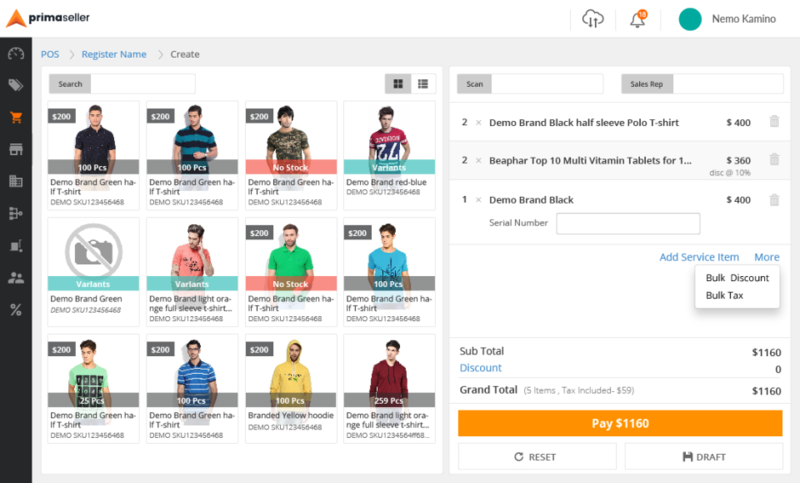 Also, integrate Primaseller POS with your online channels to sell on multiple channels of sale. Visit www.primaseller.com and sign up for a free trial or demo today! Amazing software which has made our working life easier as we are a growing company!! Pros: Primasellers software has so many features to enable the smooth running of our company after searching everywhere for a software package that can communicate with Woo-Commerce, Quickbooks and our shipping company etc, Primaseller most certainly ticks all of the boxes! Previously we had disjointed processes and now we can link to all of our packages which has lead to the reduction in the work load significantly leaving us time to concentrate on new projects to expand our company. Just the simple things like invoicing, has reduced our time significantly with the ease of the automated process in Primaseller and syncing to our accounts package. Inventory control had been a major issue with our company before and now we can grow our company with ease ensuring we can meet the demand of our customers. The support team at Primaseller are amazing, they always respond to you quickly and nothing is to much trouble!! Cons: There is not much I would class as a negative, if there is any issues or observations to ease a process I always feedback to the team and they add it to their development list or fix straight away. Cons: Sometimes runs slow on low bandwidth internet. Overall: Primaseller has been our only solution since we started using it at Select Jewels. Specially the web app runs smooth and fast, i am able to operate from literally anywhere. I run online operations of my company from bangalore and the dispatch facility is in Jaipur. 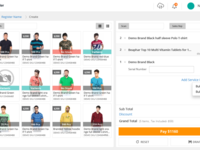 It has been a great help managing all the orders be it B2B, online or POS with awesome ease. Recommendations to other buyers: Need to improve UI for mobile usage. We are just new into this and find it a bit confusing, but customer support is very helpful! Pros: We like the POS and inventory management. Also, Al from primaseller has been very helpful! It will be nice to split our warehouse and we are excited to see how it all works at our first convention! It's also great to have it all in one space. Bar coding was easy to set up and works well so far! 2. Does not give live shipping quotes. This hinders us from using the system to its fullest as we cannot use it for over the phone orders, we will have to continue to use our BigCommerce to do this and our online orders. We will only process orders with this while at conventions to use the POS. 3. I have found out we will still have to update on both Primaseller and BigCommerce for somethings, like pricing and adding new products. Primaseller does not mirror pricing. Pros: It is online , simultaneously billing at multiple computers. Cons: Channeling of products from particular inventory, each time it automatically channeles product of all inventories. 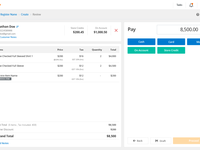 Overall: I was using software for billing 1st time for my POS. I was totally unexperienced, so team primaseller helped me out at each and every step. And helped me update my business. Numerous suggestions given by me, they tried to provide as much as they can and still working on some updates, like search history of customer by his/her mobile number, ledger maintainance in software itself. Etc. Overall experience is good and hopping more features to come soon in this app that will help me surveillance my business in much better way. Thank you primasellar. Recommendations to other buyers: Please instal feature of checking history of customers by mobile number, ledger maintaince, highlight bill in which partial payment is done or whole amount is debt . Thank you for your review Sourabh! We are working on rebuilding our order processing and will be picking up some of your recommendations within the next quarter itself. Thank you once again for your trust in us and the positive review. One Stop Shop for all your orders! Comments: We were struggling with daily orders from various marketplaces and needed a central solution for this. We were also looking to centralise our inventory and sync it with sales happening online & offline. This is where PrimaSeller has helped us totally. After signing up.. integration was a smooth process with the wonderful team back in Bangalore. A few steps and we were already processing orders within minutes from the new backend. The staff happy and more relaxed when it comes to order processing.... Thanks Primaseller! Pros: Seamless integration with marketplaces & accounting software. Cloud based software enabled timely updation of data. Ability to raise purchase orders and manage B2B orders as well. Excellent Customer Support - They have been ready to help us in any way possible since day 1! Overall: Primaseller gave us exactly what we were looking for when we were looking for a software to take care of our orders and POS while integrating our inventory. They have excellent support and on boarding and that made the process of familiarizing the software a breeze for my employees. The product is robust and has a lot of features and integrations which we wanted. We wish them all the best and hope they keep up the good work! Recommendations to other buyers: Considering the new features that they have in store and the existing features they have, this is a must have product for all online and offline retailers. Pros: What I like most about Primaseller is the fact that they have included all the significant features that an ordinary retailer would be looking for. Right from inventory management to order processing to barcoding, they have a good number of useful features. Cons: I would have liked it if they integrated with Paytm and Shopclues as well, as I intend to sell on these channels too. Overall: We have been using Primaseller for the last 8 months. We have an online as well as retail store. When the inventory at both these channels get synced, the whole process becomes much more simpler and clearer. Primaseller helps us to efficiently implement this sync and easily process orders. Recommendations to other buyers: They are pretty reasonably priced for the features they offer. Thank you Shannon for the encouraging review! We will strive to make Primaseller better so you have an even better experience. Comments: We have been using Primaseller for quite some time now. We are a B2B entity and sell online as well. Without integration of these 2 channels, it would've been quite difficult for us to track inventory and manage stock efficiently. With Primaseller, there is much better management of inventory and orders. Their support is also commendable. Thank you Dev for your awesome review! We'll continue to work on making Primaseller better for you. Good product for multichannel sales! 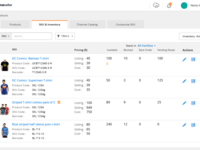 Overall: I use Primaseller for managing orders and inventory for my Amazon and eBay stores, as well as my own online store. With their software, it's very convenient for us to manage these 3 channels of sale, as there is no hassle of multiple logins and individual management. We can evidently see a lot of time saving happening. It's a pretty smooth software and easy to work with. Great product that makes Distribution & E-commerce equally easy !! Cons: Would surely recommend the team to go ahead with shipper integrations too, which would actually make it a Fabulous product. Overall: I am a distributor of Cutlery products also selling them on Amazon, Flipkart, Ebay. When it comes to me "Managing inventory" was the most tedious job. After subscribing to Primaseller it has helped me in managing the inventory smoothly. Its great to manage your Online orders and your B2B orders in a single platform, i appreciate the effort taken by the team to bring in such a product that would actually help distributors like me. I would definitely recommend Primaseller, it is a very simple but feature enriched software. 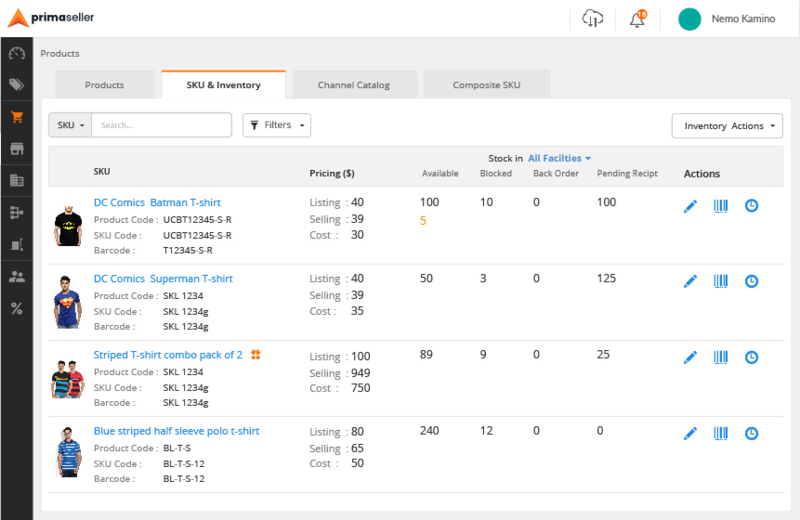 Out of all the similar inventory management softwares I have tried my hands on, Primaseller struck me as the most efficient and cost-effective platform. Overall: Awesome Team willing to help get a solution for our business needs ! They have made PrimaSeller into an all in 1 business solution for us. Thank you for the feedback, Sandeep! We have more features coming up in the following months to address your concerns. 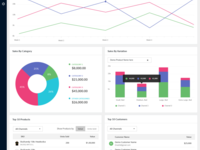 Pros: able to connect with most online market place, as well as accounting software (quickbooks). Comes with a free POS software as well. The best part is the support. I always have my questions understood and answered within minutes, no matter what time of the day! This is really important for small business with limited resource. Cons: Lacks the product push ability, while it is able to sync from an online market place, it is not able to push it into other channels, so it lacks a bit of speed if you are running multiple stores. Overall: This is by far the best support guys I have seen! 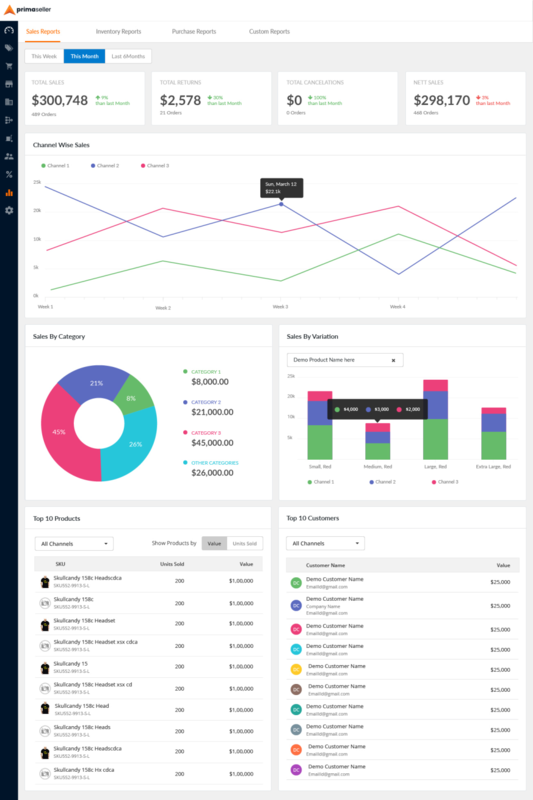 a very easy to use system, nice UI and certainly value for money..
Pros: It is a very well designed cloud based system with nice user interface. Easy to understand and certainly value for money. Cons: There isn't much which I don't like about the system but it would be great if an APP is added to the system. 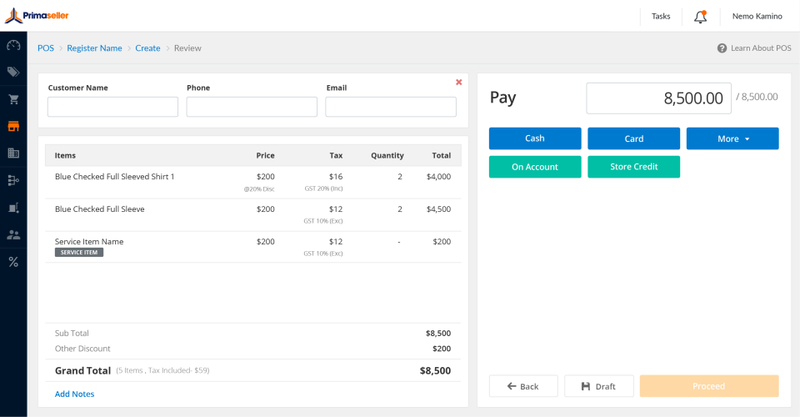 Primaseller is exactly what I wanted for PoS which integrates with WooCommerce. * Primaseller is a clear winner in comparison to LightSpeed you need to purchase WooCommerce plugin. Pros: Very user friendly and intuitive , fantastic support from right within the page you are on. Would recommend it to any business that is trying to sell online and has a physical shop. Cons: Only downside is it is cloud based so if your internet connection is not good this can cause problems, not a problem with the software but you should be aware of it if you want to use the POS system and your internet isn't great. Overall: Primaseller's integration with Quickbooks has helped a lot in managing our accounting needs. Manual entry of data used to create a lot of errors earlier. With this software we are getting automatic sync of inventory and sales data with Quickbooks. This helps us to always have up-to-date financial details. Thank you Philip for the kind words! Shipping is on our road-map and you can expect it to roll out in the following months. We'll keep you posted! Comments: I strongly recommend Primaseller for retail outlets. Pros: The flexibility of the software really encompass the management of retail store and it is ability to integrate online store. It is very simply to comprehend and gives room for good report tracking. Cons: Though the interface is friendly and mobile friendly, however their is still need for the screen to properly adapt to mobile version. It does not survive slower network. Cons: It's complex, but that's not a con really because that's how it's supposed to be having so many features. Overall: We're a small business and we've started using Primaseller recently. After trying other options and comparing, we're so very impressed with their customer service, available always and responding efficiently within 5 minutes or less, they make all the tricky sides of using a new complex program much easier and pleasant. We're really grateful. Comments: We have been using Primaseller to manage our order and inventory management for some time now. I own 3 apparel stores across Bangalore. So, the software platform that Primaseller provides has been of great help to manage all the inventory at our stores. Another aspect I felt great about them is that, I dont have to manually update each and every invoice that I make for accounting purpose. 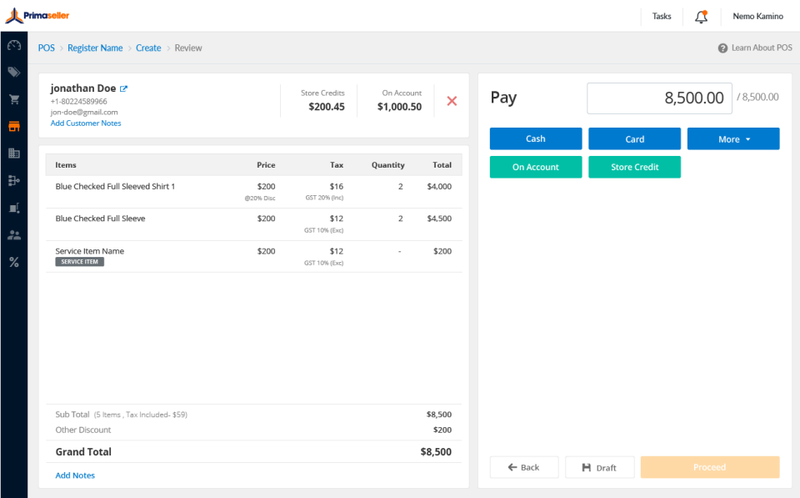 All invoices get made on their platform itself and gets automatically synced with accounting software Quickbooks . It actually saves a lot of my time as a business person.I also got very good support from the team there. They are quick to respond and are there to help always.The software seems to be quite useful and efficient. Thank you for the kind words, Rahul! Pros: Inventory control was a problem at the office, Primaseller has helped a lot. It's easy to use. Great System with Awesome Features! Comments: We were looking for a one stop shop for our order management & inventory processing, and Primaseller helped us do just the same. The app is seamless with its systems and the team behind the app is hands on with support and is very open to feedback and more importantly the implementation of features post the feedback. Would definitely recommend every vendor to use this! Recommendations to other buyers: Please go ahead and use this app blindly for your daily order management needs! Cons: it is still a relatively new software so there are some glitches every now and then, but, every time the Primaseller team has been very quick and responsive in dealing with technical issues. Fantastic Exp.. easy to access...! Comments: Very use full. value for money, We have been using Primaseller for quite some time now. We are a B2B entity and sell online as well. Without integration of these 2 channels, it would've been quite difficult for us to track inventory and manage stock efficiently. With Primaseller, there is much better management of inventory and orders. Their support is also commendable. Recommendations to other buyers: Primaseller is good software to use for growing business. Comments: Primaseller is a fantastic platform to manage inventory across online and offline channels to have seamless back end operations. The team has worked with us over the last few months to incorporate several features that we required for our operations. We wish them much success and growth! Hi Rashi! Thank you for being the superb customer that you are. We've learnt from your feedback and are glad our efforts have paid off! A must for growing etailers! An easy to use & clutterless software with great UI/UX. We loved that they are always there to listen and solved all issues quickly. A team which understands each tiny bits of e-commerce and keep innovating made us satisfied that we are backed by amazing pros. Our team is thrilled to receive such awesome feedback! Thank you so much for the encouraging words. Comments: This new software and portal look good and it Is user-friendly too. Can add some more features like, number of fake orders per month, category wise product sold per month or annual and color wise, size wise etc. Overall it's a user-friendly thing and the customer support is really doing a great job. Pros: Good & easy to use. Cons: Need to update more on detailed reports. Recommendations to other buyers: You guys are doing good in terms of giving customer support, just need to have more focused on getting more advanced which will definitely boost more business in future. Comments: The portal is very easy to understand.It has been a great help in handling inventory. Just a concern, am unable to view stock for past days; if this could be changed. Thank you for the feedback Sameera. As of now we support detailed SKUwise inventory history. A date-wise snapshot of past inventory as a whole is something we will consider for our future product upgrades.